TrepStar Turn-around time, Shipping Methods, Delivery Date Estimates, and refund policy. Create and set up your project in as little as 20 minutes. Once your project is setup and approved, you're ready to order. Once an order is submitted to TrepStar, we start to manufacture immediately. The product is manufactured within 24 hours and shipped to any address. Your product is often shipped the next business day. * We ship to any domestic or international address using USPS. * See how to estimate total shipment time below. For example, if you ordered right now, because the time now (4/22/2019 7:08:52 AM) is before 10:00 AM central time, the product would ship within 1 business day(s) which will be on Tuesday. Keep in mind this turnaround time assumes your account settings have a short Modify Address: X Hours setting**. While TrepStar offers no guarantees for how long the post office will take, we will get your product in the mail-stream in a timely manner. All times listed below are estimates and averages. We reserve a full business day (24 hours) to manufacture the product before it ships, but some products ship the same day if ordered early that day (before 3:00 AM CST USA and you have a short "Modify Address: X Hours setting"**). If you order after 10:00 AM central time on a given day, it will not ship that day, but most likely the next business day after that (assuming a short "Modify Address: X Hours" setting"**). If you order late in the day, it may be in the mail two business days later. We will print postage within a few hours after the order is placed/paid which depends on your "Modify Address: X Hours" setting"**. You will have access to tracking information when postage is printed. This is normally within 1-10 hours after the order was placed. This delay depends on how you set your "Modify Address: X Hours" setting"** You can update the tracking information on services like Amazon & eBay etc. even before we get the package in the mail. Example 1: if you place your order early Monday morning (before 10:00 AM, and you have a short "Modify Address: X Hours" setting"**), we will make the product that day or evening and it should make it in the mail on Tuesday (but it may make it in the mail as early as Monday afternoon). However, if you order after 10:00 AM on Monday, it may not be in the mail until Wednesday (but often will be in the mail Tuesday). Example 3: if you order on Friday, it will ship on Monday. There are some cases where products ordered very early Friday (between midnight and 3AM) may ship by Friday afternoon (but don't count on it). When you order, look at the recent orders report. See the tracking link(s). You will see exactly when we printed postage, and exactly when the post office scanned in the package that we delivered to them. You'll see our turn-around time is very fast. Please factor in any delay as a result of a high "Modify Address: X Hours"** setting. ** There is a TrepStar account "Modify Address: X Hours" setting which creates a delay between when the product was ordered, and when the postage is printed. You and your customer may modify any mistakes in the address during this time. To avoid delays in shipping, make sure this "Modify Address: X Hours"** is set as low as you're comfortable with. This delay is the same as if the package was ordered that many hours later so it pushes when the product will get into the mail-stream. * We try our best to ship Priority-Express and Priority orders as soon as possible (next or same day) even if you miss the 10:00 AM deadline but this will only work IF you have a short "Modify Address: X Hours"** setting (1 hour or less). We often get Thursday or early Friday orders in the mail Friday afternoon (we just do not promise that). The post office closes early Saturday and is closed Sunday, so we do not ship any items on the weekend. Friday afternoon is the latest post office drop. Standard vs Standard + Tracking: Often, there is no difference between choosing Standard or Standard + Tracking, especially for multi quantity or multi product orders. If your package is a single quantity thin light weight disc or usb in a sleeve or EcoPack. If you choose 'Standard' we ship at the lower cost envelope or flat rate. There is no tracking in this case. If your package is a single quantity product in a CD or DVD style case, this is a parcel and is normally under 8oz. This means it will be the same price regardless if you choose 'Standard' or 'Standard + Tracking'. Tracking is included. If your package is over 8oz, any packages shipped 'Standard' will go at the lower cost, but slower 'media rate' which does include tracking. If you choose 'Standard + Tracking' any product under 16 oz will ship at the first class mail parcel rate which can be a bit more expensive than media rate, but is faster. Standard: Under 8oz is first class 2-3 days average, 2 weeks max. Over 8oz Media Mail Parcel 4-8 days, 2 weeks max. No tracking if we can send at the lower cost letter rate when your product is packaged in a sleeve or EcoPack. Standard + Tracking: 2-3 days average, 2 weeks max. First class up to 15.9 oz. 1 lb or over Media Mail Parcel 4-8 days, 2 weeks max. Tracking always Included since this shipped as a parcel. This is used for packages that weigh less than 16oz. Shipping for packages over 16 ounces: Regardless if you choose Standard or Standard + tracking, if a package is 16 oz or more (most multi-quantity orders), the post office categorizes these packages as parcel select (no longer first class), thus, it ships as what they call Parcel Post/Media Mail (which has a 4-8 day delivery time). If you have a package at or above 16 oz (like most multi quantity or multi product orders), use Priority mail if you need a 2-3 day delivery time. Priority (2 to 3 days). Priority mail. Tracking Included. We try to get priority and express packages out as fast as possible. They go to the front of the line. Express (1 to 2 days). Priority-Express Mail. Tracking Included. We try to get priority and express packages out as fast as possible. They go to the front of the line. Express packages almost always arrive 2 business days after the order has been paid and postage printed (make sure you have set a very low "Modify Address: X Hours"**). We try to get these in the mail the same day or the next day (worst case). Use this choice if you need to guarantee Amazon 2 day delivery for Prime members (domestic addresses only). Shipping Express mail is the ONLY way you have a chance to get a delivery within the 2 day Amazon Prime delivery requirement. Standard First-Class Mail International (Usually less than 10 days with a 4 week maximum). For INTL packages, it does not matter if you choose standard or standard + tracking. It's the same rate. Tracking is available to the destination for many countries but not all. In all cases, there will be tracking until it leaves the USA. At that point, you may or may not see additional tracking. This depends on the destination country. The post office changes and improves each month so tracking features usually improve and is often provided all the way to the destination. Western Europe and Canada are the best. Priority Mail International (6 to 10 business days). Tracking Included. NOTE: If the package weighs more than 4lbs, the post office requires that it ship via Priority or Priority-Express. We automatically switch your order to Priority shipping if you pick Standard or Standard + tracking since by post office rule, anything over 4LB must be sent at Priority rates. Priority-Express Mail International (3 to 5 business days). Tracking Included. If tracking is available, an email with tracking information is sent to the email address used during ordering. This does not occur if you have customer email notifications turned off (edit your project and publisher settings). To locate any available tracking for an existing order, you may search for a customer record from within your account or click the recent orders button. If you choose the 'Standard' shipping method, AND order quantity > 1 for a domestic address (USA), we automatically upgrade to Standard + Tracking. For domestic addresses, if the package is over 13 ounces, it becomes Parcel Post/Media Mail which has a 2-8 day delivery time. If you need large packages sooner, ship Priority mail. IMPORTANT: TrepStar will make sure your package gets produced, packaged, and delivered to the post office in a timely manner, using the address you provided. However, we do not guarantee delivery. Most of our cost is postage and labor so if we offered free resends or refunds for any case (like a retailer) our prices would just be higher. As the saying goes, "there is no such thing as a free lunch". We are your B2B provider. Our prices are set at low wholesale prices to serve our best publishers. Lost, delayed, or the occasional broken package are your cost of doing business that you need to plan for. We keep prices low for this service instead of taking a percentage of your retail price or simply charging more per order. Since you are able to charge as much as you want, you must plan for the cost of the occasionally lost, delayed, returned, or broken packages. Lost packages are uncommon. However, a small percentage of domestic packages are lost by the USPS (1 in 2,500 for domestic). It is more common an international post office will lose packages or create large delays (1 in 500 for International). Some of the most unreliable post offices are in countries like India, Russia, Asia, and the middle east (generally, countries least like the USA). Please factor lost package costs into the price you charge your customer (since we do not offer refunds for lost packages). Delays are more common than lost packages. Probably 99% of packages will arrive in the average stated times (or close to it). However, about 1% (1 in 100) packages do take extra time above the normal average (delays of days or weeks in some cases). International shipments may take weeks or months unless you order Priority or Express mail. Countries like India, Russia, and parts of Asia and parts of Africa and the middle east are not very reliable (more delayed packages on average). You send to those countries at your	own risk as we offer no refunds for lost or broken packages (which is rare but can happen). Tracking: Most standard shipments to other countries may show tracking to Chicago or New York, at which point no further tracking is available. The package is still in transit and in the hands of a foreign nation. If you order Priority or Express mail international, you do get more tracking information once the package leaves the United States. The amount of tracking you receive depends on the destination country, and enhancements to the USPS system. Return Package Notification: As part of our service, we do notify you by email when we receive a returned or refused package so you can contact your customer and decide whether you want to order it again (at your cost). Most other fulfillment services just throw your package away with no notification to you. We do not offer credits or refunds for returned packages because the added labor cost we incur while handling returns and dealing with publisher email inquiries more than offsets any benefit we might receive from reusing inventory. For a short time, upon request, we may resend the package to a new address for a $3.95 handling fee plus postage. Breakage: Our single quantity orders ship in a bubble mailer (or envelop for domestic sleeve type packages). Some packages do get broken which you need to factor into your prices. Our prices are wholesale prices without any "retail" mark-up to you. Charging retail prices is how retailers can afford to offer refunds to customers. We are your wholesale supplier and our prices do not include guarantees for breakage. Most of what we charge you is postage and labor. If you have a dispute with a shipment, contact the USPS. In any event, breakage is fairly uncommon. Perhaps 1 in 2000 for a domestic address if in a DVD style case and about 1 in 700 for a sleeve, or EcoPack. There will be a higher rate of breakage if you choose a CD/Jewel style case which is more rigid and breaks easier (1 on 100). Sleeves are more fragile than DVD style cases but CD cases crack easily even though we use the best, heaviest CD cases we can buy! The rate is higher for International addresses (perhaps 2 or 3 times higher). If you order in bulk, they go in a larger more rigid box which prevents breakage quite well, but they are too heavy and expensive for single quantity orders (see below). There is a balance between cost and weight of packaging vs. average breakage rate. We have chosen lightweight bubble mailers for single quantity orders because each shipment is at a lower cost than a box which over time, is much less costly than it is to replace the occasional broken package. For example, if we shipped in a rigid box, it would cost about 40c extra in postage, and the box is about 40c more than a bubble mailer. Thus, for 500 packages, your cost would be $0.80 x 500 or $400.00 extra for postage and packaging. Instead, it makes much more sense to ship at a lower cost, and deal with the occasional replacement which will cost you under ten dollars. That's why we always use the lighter, less costly bubble mailer for single quantity orders. In addition, even if we used boxes, breakage still occurs. Ironically, experience has shown that the breakage rates for a small single quantity mailer boxes is about the same as bubble mailers. The post office treats boxes more roughly than softer bubble mailers which functionally eliminates any theoretical advantage of a stronger packaging box. The post office realizes bubble mailer means fragile. During the sorting process, all boxes are moved and dumped into large bins. During this step, a small box might be crushed under any number of larger boxes that can weight up to 70lbs. All bubble mailers and other envelopes get sorted separately from boxes. Bubble mailers and envelopes will always be lighter and more flexible so there will be no large heavy boxes with the potential to crush the bubble mailer contents. The longer the route, and the worse the destination country, the more likely it will be broken. 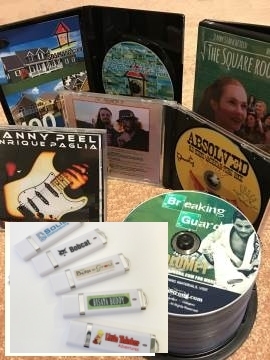 When choosing a CD Jewel style case for discs or USB, remember this: They will crack more easily if you send a lot of single quantity orders. DVD cases are more durable. If your customer complains about breakage, you'll need to factor this into your prices since you will have to order again at your cost if they want a new one. You may purchase empty cases to ship to you or directly to your customer. Used when 'Standard' shipping is selected if your product is a DISC/USB in sleeve or EcoPack. Light DISC or USB in sleeves or EcoPacks can ship at a low cost envelope letter rate for domestic packages. If you require tracking, choose 'Standard + Tracking' on the order form. Envelope packages costs	a few dollars less than rectangular parcels, but there is no tracking for envelopes. All INTL packages will ship as a FLAT or RECTPARCEL depending on quantity and amount of products ordered (see below). FLAT is used for thin multi disc orders like 2 discs in sleeves if 'Standard' shipping is chosen during ordering. However, no tracking is provided for Domestic flats. Regardless if you choose 'Standard' or 'Standard + Tracking', INTL shipments where quantity is 2 DVD case sized products or smaller will ship as a FLAT package which is at a lower rate than heavier parcels. Some tracking (depending on the country) is provided for international FLAT or RECTPARCEL packages. By special rule, we are able to ship these at the lower cost FLATs rate using the Endicia/Stamps.com Global Access Program (GAP). Any CD or DVD case style products (for discs or usb) are considered rectangular	parcels by the post office when shipping to USA addresses (domestic). For this reason, the package type will always be RECTPARCEL for domestic addresses regardless if you choose 'Standard' or 'Standard + Tracking' when ordering. Most multi quantity or multi product orders will ship as a RECTPARCEL. Domestic rectangular parcels always receive tracking but cost a few dollars more than envelopes or flats. Any international shipment that has more than 2 DVD cases will ship at the RECTPARCEL package rate which is more expensive than the FLATs package type regardless whether you choose 'Standard' or 'Standard + Tracking'. INTL FLATs or RECTPARCELs both will receive some tracking depending on the country.